When Caitlyn Camelio heard a pop in her knee while playing soccer two summers ago, the Falmouth lacrosse standout knew it was bad. An incoming sophomore at the time, Camelio dropped to the field following a collision with another player, whose knee hit Camelio’s in just the wrong way. Camelio tore her anterior cruciate ligament, taking her out of sports for the next eight months. Using the setback as motivation, Camelio worked on strengthening her leg and her lacrosse game during the offseason. Though not initially considered one of the state’s best players, she surged onto the radar of coaches this season while leading the Yachtsmen (13-2) to their first state championship. For her work ethic, growth and positivity, Camelio is the Maine Sunday Telegram’s girls’ lacrosse Player of the Year. 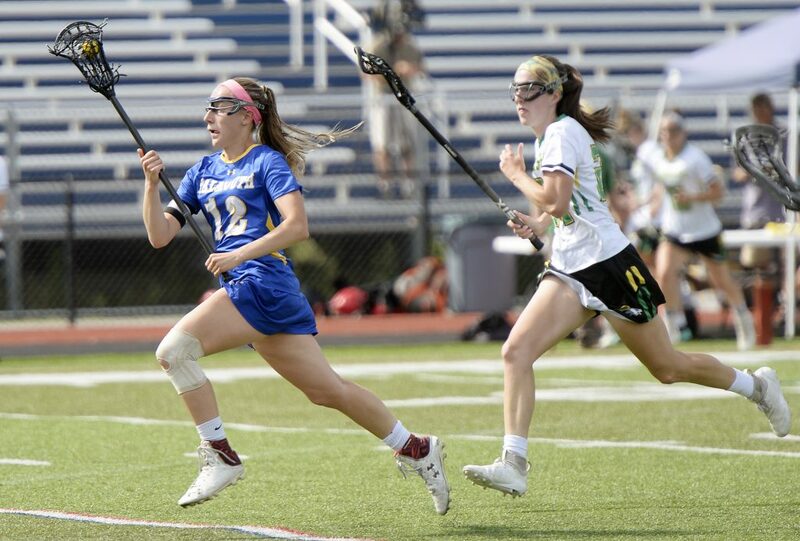 Camelio finished her junior season with 56 goals and 25 assists, and scored four times in the Class A final as Falmouth dethroned Massabesic with a 10-7 victory. Perhaps her most important goal of that game came with under six minutes left after Massabesic cut Falmouth’s lead from five goals to two. “That insurance goal was huge – I don’t think I exhaled until then,” Pullen said. Also a member of the Mass Elite club lacrosse team, Camelio competed in this year’s national tournament on a Maine team coached by Marshwood’s Bernie Marvin. After tearing her ACL, Camelio started attending physical therapy three times a week, and she was able to return just in time for lacrosse in the spring of 2017. However, Camelio called that season “a rebuilding year” for herself, noting that it was the first time she’d sprinted since suffering the injury. “I was dying to get back. … Then I just spent the summer working on my skills,” Camelio said. Camelio exudes positivity in all aspects of her life, from the encouragement that she offers her teammates to the manner she communicates in text. “In her few-line emails to me, it will be like three sentences with six exclamation points,” Pullen said. “But it’s so genuine – that’s her personality.